Last Week just before the latest blizzard hit us my next order of seeds purchased through the Homesteaders Coop arrived. 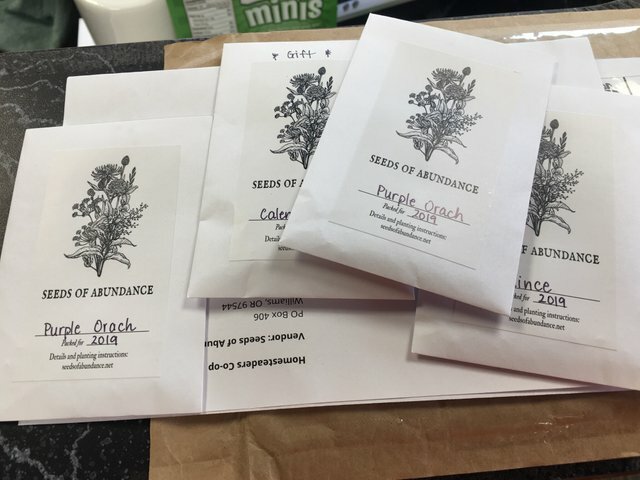 This time I purchased from Seeds of Abundance. I purchased some Purple Orach . I had read about this handy herb on @sagescrubs post and decided it was something I needed. I also purchased some quince seeds. We had a quince tree in our yard in California and made good use of our harvests. I have read it will grow in zone 4 so we are giving it a try. Finally I received a gift of calendula flower seeds! I am stoked and while I am planting these seeds in my garden I am planting the seeds of Steem as a currency! Thanks to @sagescrub and the homesteaders coop for the amazing products and platform. We are building value and getting value and empowering ourselves. Right here I thought I should throw in a plug for @bowentroyer who is offering labradoodle puppies for sale for Steem. So don’t let that Steem burn a whole in your pocket spend it! Earn It! Use it and build value. Have a wonderful day and thanks for reading my post! I am so glad you got the seeds OK! Thank you for choosing our shop to spend some of your steem. It means a lot to us :) I look forward to seeing the orach and calendula and other plants growing in your garden this season! I suspect there is a little ways to go since you are in zone 4! RE quince seeds they will need a few months of cold stratification to germinate. Wishing you lots of abundance in your garden this year! Thanks We did get some onions in the ground just before it started snowing again. Can’t wait to get out there and get serious.